This is my second post about our new Family Service Chore Manager Kit. I recommend reading the first post to read about how the system works before reading this post. Click on Part 1 to read the first installment. In this post I will be talking about “Family Guidelines” which are included in this kit. These are the blessings, consequences and expectations that go along with our new chore system. Here is a picture of the whole system hanging on the wall in our hallway next to the boys rooms. It is easily accessible and they see it everyday multiple times a day in walking to their rooms. I explained the contents of the above picture in part one but the only thing I didn’t mention was the “Family Guidelines” sheet. 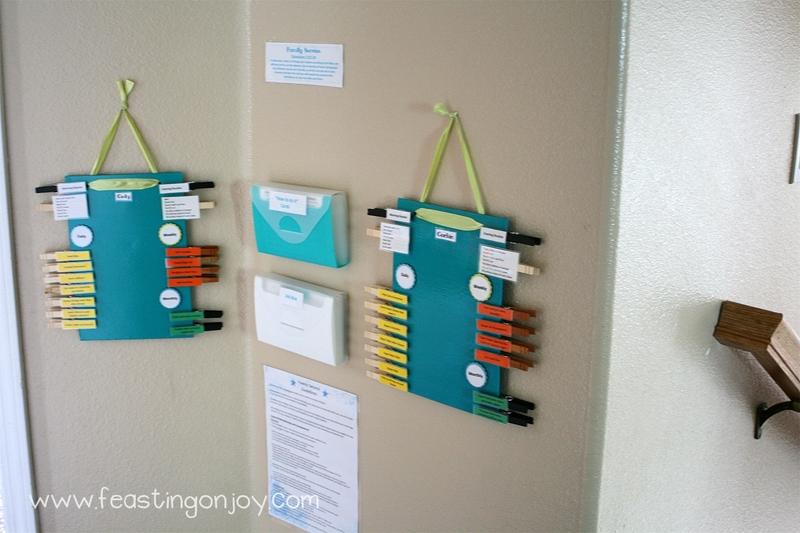 That is pictured below the “How To Do It” and “Job Box” boxes on the wall. It is a laminated 8.5 x 11 piece of cardstock that states family guidelines for this Family Service Chore Manager Kit. When we first implemented this system my husband and I felt it was very important to sit down with both boys for a family meeting. During this meeting we went over the whole system and how it works and spent a good amount of time going over the “Family Guidelines” page. This helped them to further understand our expectations, know what blessings they could expect and know what consequences would be applicable if needed. We did this so we could all start out on the same page and nobody could say, “I didn’t know that.” It also helped because my older son had several questions and we were able to answer them for him. He also brought up a few good points of things that Steve and I didn’t think about and I was grateful for that because I ended up changing some things. The Family Guideline sheet was not only gone over in person with the boys but it also hangs with the chore system so they can always reference it if they have questions. What time and which chores need to be done in the morning before breakfast. 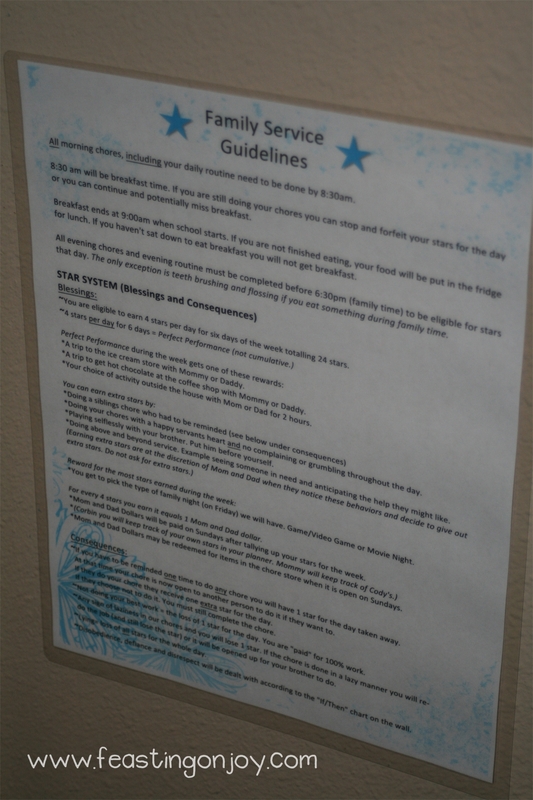 Instructions for our Star System which included blessings, and consequences. In the kit for purchase, for all kit components, there are blanks to be filled in that are specific to your family dynamic. I also have a fully editable version available for purchase where you can type your own information in the blanks. Doing their own chores with a happy servants heart with no complaining or grumbling. Playing selflessly with each other. Re-doing someone elses chore who did a lazy job. Doing above and beyond service like seeing someone in need and anticipating how you can help them and following through, etc. If they do any of the above (except for re-doing the job) then they cannot ask for an extra star. It has to be noticed by us and we will give it. The idea is that they are doing it from a servants heart and not purely for the blessing. Just like in life when we give, we give to bless not to receive but sometimes God does bless us in unexpected ways. My oldest is expected to keep track of his stars in his planner each week. 8 year old and above should be able to keep track of their stars. If he forgets he doesn’t get to go back and write them in – that day just doesn’t count. It is kind of like a time clock at a job. I keep track of my youngest son’s stars. In the morning if the one of them does not finish their chores before breakfast they have a choice – they can either continue their chores to earn their stars and come to breakfast late or they can come to breakfast and forfeit their stars. We have breakfast at the same time every morning during the week and we start school at 9:00am every day so all morning stuff has to be done by then. The same rule applies to dinner. It works out well. A trip to get Ice Cream with Mommy or Daddy. A trip to get hot chocolate at a coffee shop with Mommy or Daddy. Their choice of an activity outside the house with Mommy or Daddy for two hours. This could be going to Toy’s R Us (not buying toys just looking), going to the park, whatever they want to do – within reason of course. If one of them gets a perfect performance and the other one does not then only the person who achieved the perfect performance gets the reward. For instance, they both don’t get to have ice cream if only one of them earned it. We also give a blessing (or reward) for whoever earns the most stars during the week. The reward for this is that the achiever gets to choose what kind of family night we are going to have. We have a family night every Friday night (or once in a while on Saturday) and it is either Movie Night complete with all the goodies, A game night with fun snacks or video game night with snacks. We have also done a coloring night and Lego night before and those have been fun too. The winner gets to choose which kind of night and if there is a tie one gets to choose the kind of night and one gets to choose which movie, or video game or game to play. Lastly, for the star system every star (including the extras) is worth one Mom and Dad Dollar. These are paper money that say “Mom Dollar” or “Dad Dollar” on them and are included in the kit. They get paid every Sunday after we have announced now many stars they earned and who was the winner of the most stars for the week. These dollars get to be redeemed at our “Chore Store” which is open every Sunday after we get home from church. The store is a plastic bin that is stocked with things like gluten free sweet bars (which are treats around here), organic bubble gum (treats too), yo-yo’s, action figures, hotwheels, books they like to read, other various snacks that are rare treats, small denomination gift cards and they also have an opportunity to purchase video game time here. Allowable video game time is usually 1-2 hours for the week that they can purchase. That’s all they get to play. They don’t purchase TV time because for one we don’t have cable or netflix and for two our movie time is usually only about 4 hours per week. The items in the store are priced from low to high and the high priced items require the boys to save their money throughout many weeks. We love that it helps teach them to save. Our oldest has gotten really good at saving. It also teaches the boys that it can be a challenge to buy what you want in your budget and it requires hard work to earn the money to buy things. Once in a while the chore store has specials where there will be 1/2 off an item or $1 off something just to make it interesting. Now let’s talk about the consequences. These are much shorter than the blessings. If the boys have to be reminded one time (after life skills week) to do a chore, they lose one star. I am more strict with our oldest son about this because he is older and can read. Our youngest gets a bit of leeway here because he is 4. If they are reminded to do the chore, it is now open for the sibling to do AND earn a star for doing it. If there is any sign of a lazy job the person loses one star and the job is opened for the other person to do in which they are able to earn an extra star. If they are caught lying then they lose ALL of their stars for the day and we take other disciplinary action along with this. Lying is unacceptable here. Proverbs 12:22 says the Lord hates it and frankly, so do I.
Disobedience, defiance, and disrespect, etc. my husband and I chose not to make this a part of the star system. We felt like these needed to be dealt with in a separate manner and were not directly related to family service. We actually love Doorposts products for dealing with these issues. I hope that gives you a good idea of how our system works. Of course, this system isn’t for every family but it works for us here and has been effective in training our boys and helping take some of the burden off me. I do have to say one side note. God is a God of grace and mercy and while we have these guidelines and this system and we try to stick to it there are times where grace and mercy are required. After all, God gives us these every single day even when we don’t follow his guidelines.